Luxuriate in privacy in this little bed and breakfast just 20 minutes from downtown surrounded by 20 acres of rolling hills grazed by healthy happy horses you can ride. 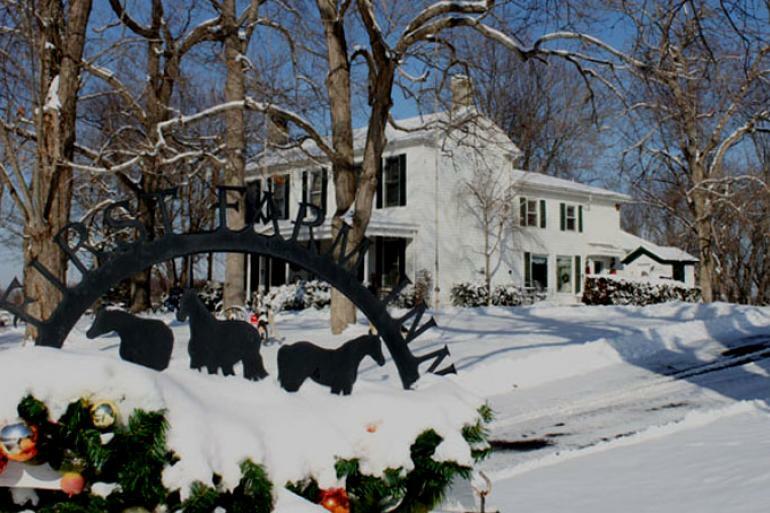 First Farm Inn is an elegantly updated 1870s farmhouse offering two spacious and comfortable rooms with queen-sized beds and private baths. Rock on the porch. Swing in the hammock. Stretch out in the outdoor hot tub. Sit in front of the fireplace. Wake to a bountiful, healthy breakfast. Historic barns, fishing, ponds, row boat, hiking, friendly cats, soccer-playing dog and more. Girlfriend getaways. Midweek, multi-day discounts. Perfect North ski packages. Bible history comes to life at the family-friendly Creation Museum! Journey through biblical history in this state-of-the-art, 75,000-square-foot museum designed by a former Universal Studios exhibit director. Located at the Creation Museum featuring over two and a half miles of zip lines and sky bridges. Looking for an exciting adventure 24 hours a day, 7 days a week? Then check out Hollywood Casino and Hotel Lawrenceburg, Indiana, just 20 minutes from Cincinnati!